A movie with really bad humor and nothing going on for the plot, this one is beyond dumb. Boy is this a bad movie. When Disney and other studios can make so many smart animated movies for kids, left and right, there’s no reason for a live action movie for kids to be as dumb as this. The humor is bad. The storyline is basic. Even the characters are annoying. The movies is about a family road trip, and there’s never been a family that you wanted to spend less time with in the car for a good amount of the movie. This one is lousy all around. The new Diary of a Wimpy Kid movie, The Long Haul, is really dumb. It’s about a family that heads out on a road trip and has a couple of encounters with different people and obstacles. There’s a point in this movie, somewhere in the second half, where their car gets destroyed in one way after another, and each is supposed to be its own original problem. This is indicative of the movie. Instead of putting any energy into the plot at all, it just has one thing happen to the car after another. Talk about stupid.The main characrer, Greg, is about ten years old and the middle child in the family. There are three boys here, and both of them get on Greg’s nerves in different ways. Rodrick is the older teenage brother, and then Greg also has a younger, baby brother. On top of that, it’s the mom and dad, who are complete stereotypes here. The mother is played by Alicia Silverstone. Here’s an actress who once upon a time took Hollywood by storm. Clueless launched her to superstardom so hard and so fast, that people never even got the chance to decide if they liked the actress, or just liked the movie. Her next two films, (Excess Baggage and Batman and Robin,) proved that it wasn’t the actresss they loved. Silverstone dropped out of the spotlight shortly after that. Similarly, the actor who plays the father was also once on the rise. It was probably around the same time as Silverstone’s success too. Tom Everett Scott had the good fortune of being the star of the movie that was Tom Hanks’ directing debut. The movie was That Thing You Do, and it did well enough to put this actor at the front of his class. But like Silverstone, that was shortlived, and his follow ups, (An American Werewolf in Paris and the Love Letter, were both painful experiences. Everett Scott also dropped out of fame not long after that. But both of them are back in this film, and it’s a sign of what a lousy movie this is, more than anything else. If these guys have been doing anything st all, over the past decade, you better believe it’s been direct to dvd movies. Other than them, the rest of the cast is composed of complete unknowns. And most of these actors aren’t very good either. In fact, the only one who is even tolerable is the kid who plays Greg, the star. He certainly has the only funny moment in the movie. It comes in an early scene, when the family visits a restaurant / indoor playground, with one of those slides that drops you into a vat of colorful plastic balls. Greg is sent to go find his baby brother, and when he gets into the pool of balls, he thinks he has lost his brother somewhere underneath them all. So Greg starts reaching into the mass of balls, pulling kids up by the feet, and he pulls up a whole bunch of kids, one at a time. None of them is his brother, but that’s not the funny part. What’s funny about the scene is the idea that all these other kids were also somewhere under the pool of balls. While Greg and his family continue going from place to place, he develops an enemy. It’s a man who is the father to a bunch of annoying little kids. Greg keeps seeing this bearded fat man everywhere he goes. At first, the situations with the guy are okay. The man’s kids steal a bunch of things from a car and Greg gets blamed for it as the kids go running by. Things like that. But by the end, we’ve got Greg hiding out in the bathtub of a hotel room, while the fat guy is on the toilet right next to him, stinking the place up. And this movie gives us every sound possible, of what the man is doing in there. It’s not only stupid, it’s also disgusting. But that’s the level of humor that this movie has. It’s for kids, and that’s fine, but there’s plenty of movies with good humor for kids, (look at all the Disney or animated movies,) and then there’s the kind of thing like this that just dumbs them down. There are jokes here about vomit, farts, poop, and anything else you can name. At one point the characters are on the Gravitron ride, (called something different here, but same idea,) where the passengers stick to the walls as the machine spins them around and around. Only Greg and the fat guy decide to have a chase on the ride, while they hang from the walls, (which is actually a kind of cool idea.) The problem is what happens when the fat guy gets a little too close to Roderick. Let’s just say, if all that happened was Roderick vomited, at least this movie would still have a little dignity. Greg and his family have two different missions throughout the course of the film. Greg is trying to get to a video game convention where a local celebrity has sent him an invitation, (turns out the man has sent these invites to anyone who has ever written him.) Greg’s family is trying to get to their grandmother’s house in time for her birthday party. It should come as not surprise that we get scenes of both. The video game master is a terrible, over the top character, and what’s lousy is that he’s not really any more annoying than every other character in this movie. From Roderick, who confesses everything he’s done bad to his parents without realizing it, during a stupid trivia game, where he never catches on, to the idiotic parents themselves, these characters are pretty awful. Apparently there have been other Diary of a Wimpy Kid movies before this, and they most likely were better. With this film, the word is that all of the actors who were playing the characters in those earlier movies, have been replaced. Maybe these actors are better and maybe they are worse. But what is clear is that this movie has gotten far away from whatever gave the films and the book series their titles. There’s no wimpy kid here. Greg isn’t bullied or wimpy at all. He’s just a regular, rational minded kid whose trying to make sense of the world, starts with his brother, Roderick. 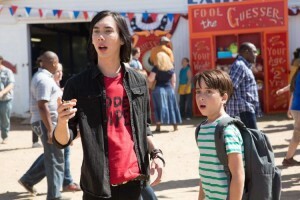 Diary of a Wimpy Kid: The Long Haul is a completely awful movie. At an age when nearly every animated film is good, or at least has some strong redemptive qualities, it’s a shame that movies like this are still being made for kids. This film is mindless and stupid at every turn. Nothing really happens other than that Greg and his family have a series of encounters with a fat guy, and try to get to their grandmother’s house. The car goes through all kinds of turmoil, and that only serves to wear us out, as we stop caring about what happens to the car, and long to see something else. This film doesn’t give it to us. The humor here is awful, and the storyline isn’t a whole lot better.